Granada, 니카라구아의 마하라자 부티크 | 호스텔월드에서 예약하세요. Beautiful property in the heart of the city, close to all places of interest, restaurants and bars, shops. 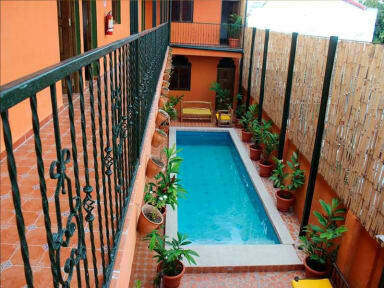 3 blocks from the lake of Granada. In addition, Maharaja Boutique is placed in the best area of the city, two floors, 11 private rooms, we have the first Hindu restaurant in the country, beautiful outdoor pool. Environment unique ethnic Hindu. Our location is privileged. We are just in front of the Cocibolca Lake, around 10-15 minutes from our location on foot. In addition, since from our location is easy to reach such lake, it is also possible to visit Volcan Concepción and the little island in which such volcano is located. 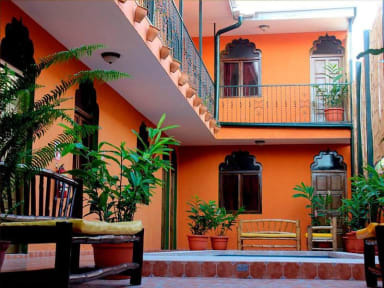 With regard to the city of Granada, we are a few minutes away walking from some of the best spots of the city such as La Calzada Centro de Arte, Casino Mundo Slot Granada or Parque Central, amongst other important spots of Granada. In addition, one of the best natural parks in Nicaragua, Masaya Volcano National Park is 40 minutes away by car, meanwhile Mirador Catarina and Laguna de Apoyo are just 25 minutes away by car. We offer to our guests comfortable rooms with private bathroom, cable TV, air conditioning, work table, we have towels and bed linen that is changed daily for your convenience, free wifi in all rooms, decoration and unique atmosphere. The Continental Breakfast is included in the price of the booking. There is another type of breakfast, the Complete Breakfast that has an extra cost of 4.00 USD.